Bastrop City Hall is located at 1311 Chestnut Street, Bastrop, TX 78602; phone: 512-332-8800. Photo: J. H. Pearcy House, ca. 1910, 1602 Pecan Street, Bastrop, TX. Listed on National Register of Historic Places in 1978. Photographed by user:25or6to4, 2012, (own work) [cc-by-3.0 (creativecommons.org/licenses/by/3.0)], via Wikimedia Commons, accessed June, 2015. Bastrop is one of the oldest settlements in Texas, and also the second oldest incorporated town in the state after San Augustine in East Texas. It was founded during the Spanish colonial period at the strategic point where the King of Spain's Highway, El Camino Real, crossed the Colorado River to connect San Antonio and Nacogdoches. Thus, the route was also known as the Old San Antonio Road. This location provided access to water, nearby timber and mineral resources, and promising lands for agriculture in the Colorado River valley and beyond. The original town was the most upstream significant settlement on the Colorado River until Austin was designated state capital of Texas in 1839 and began its steady growth. Bastrop began as a frontier outpost, where hearty settlers had to withstand many hardships as well as violent Indian incursions, although some native peoples assisted and interacted with the new settlers. But what was once the equivalent of a defensive garrison against Indian raids soon evolved into the commercial center and county seat of Bastrop County. Bastrop was named after a well-traveled friend and business associate of Stephen F. Austin who had adopted the name Baron de Bastrop for himself. The Baron assisted Austin and his father, Moses Austin, in obtaining their Texas land grants from Mexico and was appointed the colony's commissioner. Approximately 400 residents lived in the area at the time of the Texas Revolution against Mexico in 1836. Timber and agriculture were the major economic activities supporting the area in the years between Texas independence and the Civil War. Bastrop's "Lost Pines" was the westernmost stand of the eastern pine forest and therefore a valuable source of timber for what was then western Texas as well as points beyond into Mexico. 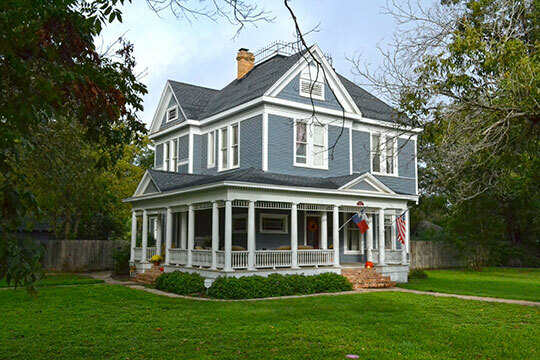 By 1860 Bastrop was a growing community of fine homes, beautiful churches, and a fashionable private school attended by the children of some of Texas' most respected families. However, the Civil War greatly disrupted Bastrop along with the entire South, with many citizens either serving directly in the Confederate armies or diverting their commercial pursuits to activities supporting the war effort. Bastrop proved resilient, with agricultural production being re-established and more significant industry developing during the post-war decades (Bastrop Iron Manufacturing Company, Bastrop Coal Company, Lone Star Mills). The raising of livestock became a more important agricultural activity in the area toward 1900. Other varied commercial activities have developed in the area to the present day. Today, Bastrop remains a center for agribusiness and hosts a variety of local manufacturing operations. Bastrop's popular State Park and local antique shops and historic attractions have made tourism another important injector of external dollars into the local economy. City of Bastrop, Texas, Bastrop Comprehensive Plan 2000-2020, www.cityofbastrop.org, accessed June, 2015.